Semi-Pro: 5 out of 10. I saw some pretty weak comedies this Family Day long weekend. 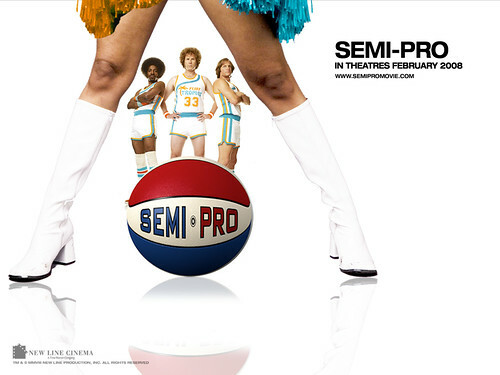 Semi-Pro was funnier than Be Kind Rewind, but it barely earned a 5 out of 10. People seem to really like Will Ferrell movies, but I'm always left disappointed. Anchorman: The Legend of Ron Burgundy was okay, but Talladega Nights: The Ballad of Ricky Bobby and Blades of Glory were pretty bad. Throw this one in that bad pile. Anchorman grew on me a ton when I saw it with a group of friends, once booze was introduced for future viewings that movie earned a place in my collection. Talladega got funnier with a group of people as well, it's good to just kick-back and have a cheap laugh at. I didn't see Semi Pro or Blades of Glory but heard bad things. I went the horror/suspense route this Family Day weekend, finally saw Zodiac which I highly recommend. By some peoples standards it's long (2 hours, 42 minutes) but it flew by for me, definitely won't want to watch this one with the kids, it has its creepy moments. The archives tell me I enjoyed Zodiac very much. I agree with you mike on the will ferrell movies. Everyone at work thinks his stuff is gold. I just want to jam them in a room and force them to watch george carlin to get an appreciation for some real comedy. I believe comedies are the most difficult genre to pump out quality stuff. Most are pieces of crap. As for Will Farrell he has the potential to be something great but he continues to play the same stupid roles. He as great in Stranger than Fiction, Elf and Old School. Jim Carey fell into the same rut. Well put Jill. I didn't always dislike Will Farrell. Anchorman was the first film where I got tired of the same old joke. Better or worse than Four Christmases?